Watches have a been vital part of everyday’s lifestyle. Over the ages their role have not changed that dramatically till the 20-21st century. Many inventors tried to add to the regular function of showing up current time and date chronograph, calculator, Alarm clock, Calendar, stopwatch. Basically the classical watch should be comprised of two primary functions: exact date and time. Tendencies have changed throughout the time. Nowadays we can see multifunctional devices that extend the way we use our smartphones in everyday activities. 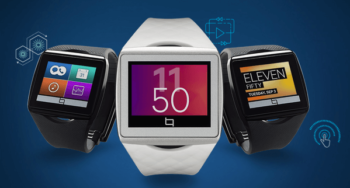 Introducing the new smart Watch Toq from Qualcomm San Diego company. The Toq works with Bluetooth 4.0 Technology and hooks up to any Android cell phone that runs on 4.0.3+ version. As for the iOS device – they are not supported at this moment but most likely to become compatible soon. Toq has own notification system that can display different types of data from the Cell phone such as texts, emails, Weather, call logs and so on. It can also work as a music player. Speaking of the operating system – it does not rung on Android, it runs on a so-called ThreadX – instant on real-time OS which can also be found in ultrasound devices and NASA space probes. The device is packed up with the up-to-date wireless technology. It recharges wirelessly through the case. The battery as well as charging system is integrated in the clasp. The device looks fresh, its sleek and responsive. Qualcomm hopes to repeat the Pebble’s success of selling more than 85,000 units and gain developers’ interest in creating specific apps for their device. The device is worth checking out! Personally I Hope that Apple will come up with something more advanced than Gear, Pebble and Toq all together!